Holloway vs. Stephens or Oliveira? Which would you prefer to see? I can definitely see Holloway on the 194 card in December. 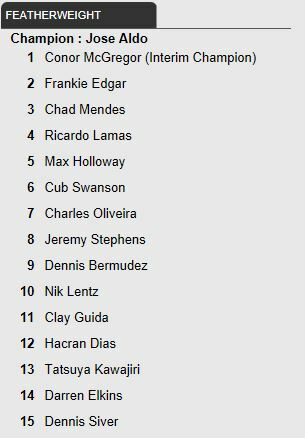 Now that the #1 contender fight between mendes and edgar are set the only 2 options that make sense are Stephens or the Oliveira rematch. I don't want to see either to be honest. I love Holloway and I would rather him vs someone else. Aloe vera. I like stephens but he did miss weight lass fight so he doesnt quite deserve a marquee matchup. He is incredibly talented and young so I would give him the benefit of the doubt. I think on his best day, he would beat Max, so I say a rematch with him would be the best. Aloe Vera takes it. Am I hip now that I said Aloe Vera instead of Oliveira? Aloe Vera if he doesn't take too long to recover, which I don't think he will based off some of what I've read about the injury. Why not Stephens vs Lamas? Guida vs Oliveira and Holloway vs Stephens. I've been wondering why Elkins is still ranked for like a year. There's quite a few guys ranked below him I think he would lose too. Guys like Ortega, Bektic, Pepey etc. would work him. I think they should do the rematch though. That way you get a fresh contender if Mendes ends up beating Frankie. I realize Stephens would be fresh as well but he just missed weight. Don't get why people wanna see a grappler vs striker matchup, Oliveira has no heart (see swanson fight for details) and just lost to Holloway. Stephens vs Holloway would be a killer fight to make, dangerous for both guys too. I agree with you. I think it would be more competitive. I'd rather see the Oliveira rematch. No other opponents make much sense for Max right now. A fight with Lentz or Hacran Dias would be a waste of a fight, and Stephens missed weight.